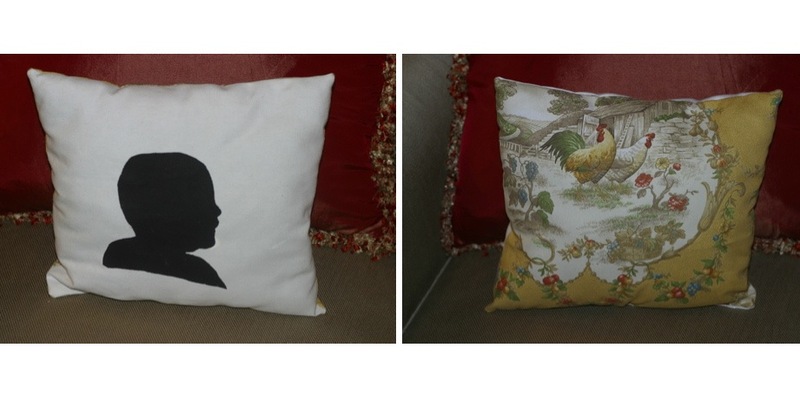 Silhouette Pillows, great homemade gift! - B. B.
Silhouette Pillows, great homemade gift! Goodness I've been busy lately, not with projects or anything really exciting...just with the joys of motherhood (you know, sweeping up what is left of my favorite glass plate off the floor, scrubing dried PB&J off of the table, chairs and cabinets. OR my favorite....wiping bums.) But I wouldn't trade it for anything, and giving them a big bear hug makes up for it all! Anyhow, I really want to share this project I did in December as a gift to the grandmas for Christmas. 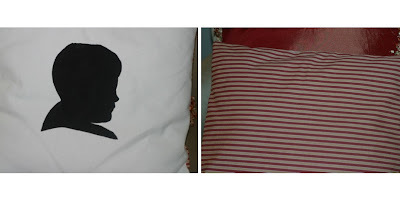 These are silhouette pillows of the kids I made as Christmas gifts last year. 1. I took profile pictures of each child. 2. I ordered 8x10 prints of each individual child from Costco. 3. I cut out the silhouette with a small crafting knife so all you have left is what you see below. 4. I taped the picture with the cut out silhouette to a thick piece of white fabric. 5. I took some fabric paint (bought at any craft store) and filled in the cut-out with black paint. 6. I let the paint dry for about 10 min. and then removed tape and let it dry overnight. I made 2 sets of silhouettes of each child. 7. I used pillows I already had on hand to cut down on cost, but with 6 pillows I had to buy some (they can be purchased at any fabric store). I recovered them so the silhouette is on one side and the fabric (which coordinated with the grands' Living Rooms) is on the other side. And there you have it! A homemade gift that lasts year round! PS if you can sew a straight line you can recover a pillow. Click HERE to see an easy tutorial on recovering already made/bought pillows at West Hampton DIY. It's a yard sale, for a good cause! 4th of July decorations d.i.y.